Submerged Arc is one of the automatic processes of welding. The weld is submerged under the layer of flux and slag—so the name submerged arc welding. The flux and slag normally cover with the arc, so that it is not visible. Submerged arc welding is a process in which coalescence is produced by heating with an arc between bare electrodes and the work. The arc is shielded by a blanket of granular fusible material on the work. The submerged arc process is widely used in heavy steel plate fabrication work. The work includes the welding of structural shapes, the longitudinal seam of larger diameter pipes, the manufacture of machine components for all types of heavy industry as also the manufacture of vessels and tanks for pressure and storage etc. It is used by many other industries in the modern steel age where steels are used in medium to heavy section thickness. It is also used for surfacing and build-up work, maintenance, and repairing sections. 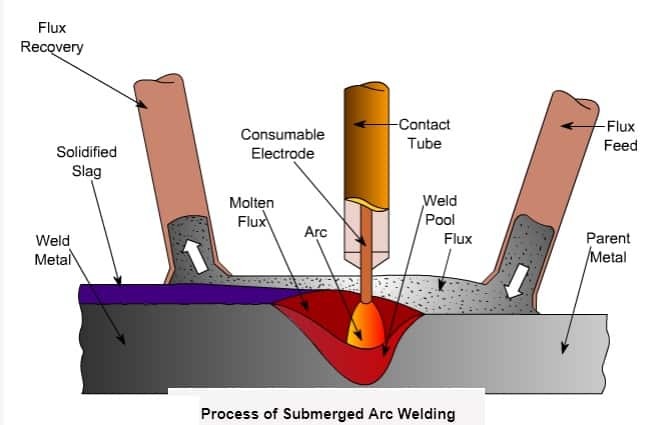 Submerged arc is called deep penetration welding in heavy section. (1) The job remains fixed, with the work arranged to move beneath it. (2) Secondly, mounted on a boom and column which can either be of the positioning type in which the works moves, or the boom can traverse at welding speed over the fixed work. (3) Gantry-mounted, so that it can traverse over the stationary work. (4) Self-propelled on a motor-driven carriage. Heads are now available which, by changing simple components, enable one item of equipment to be used for MIG or CO2, and tubular wire, and submerged arc processes. The arc is formed between the ends of a continuous bare wire electrode, which is rolled in a coil and the plate edges, or depositing surfaces under a layer of protective power, known as the flux. In submerged-arc process, the heat is produced by an arc between a continuously fed electrode and the ‘Job’. The heat of the arc melts the surface of the base metal and the end of the electrode. The melted-off metal of the electrode is transferred through the arc to the work-piece where it becomes the deposited weld metal. Shielding is obtained from a blanket of granular flux, which is directly laid over the welding zone. The flux close to the arc melts and intermixes with the molten weld metal. The flux forms a slag and floats on the surface as a protective cover over the weld bead. The un-melted portion of the flux can be reused. Automatic feeding of electrode is done from a coil and the arc is maintained automatically. (2) Trolley-mounted submerged arc welding head. D.C. power source—either Welding Rectifier or Motor Generator—can be used. The welding power source can have either Transductor control or step type control with the help of a Rotary switch for changing the arc voltage. It essentially consists of a step-down transformer. The welding head consists of the wire-feed mechanism, geared motor, wire straightening and feed rollers, welding tip, vertical adjustment mechanism and a flux hopper. The trolley is driven by a high torque D.C.-geared motor. The flux recovery unit is a powerful vacuum device, which collects the unused flux after the welding so that it can easily avoid the wastage of unused flux. Flux drying oven is required for drying the flux before using it to avoid weld defects. (1) Excellent quality of weld. (2) Smooth and uniform finished weld. (3) No spatter, no smoke. (5) High rate of utilisation of electrode wire. (6) No need to change the electrode and thus save welding time. (7) Heavy section welding in high Amps. (1) Long, large weld jobs are required. (2) Where large amount of weld metal is needed to be deposited. (3) Where the number of weld pass (multi-pass) requirement is less. (4) Welding can be done easily in down-hand position. (5) Automatisation of the weld can be done easily. (6) The jobs require special properties.